Firstly - I hope you have all had a very Merry Christmas! Now that these handmade items have all been passed on the the relevant people as Christmas gifts I would like to show you a few presents I have made this festive period for friends and also as a private commission. 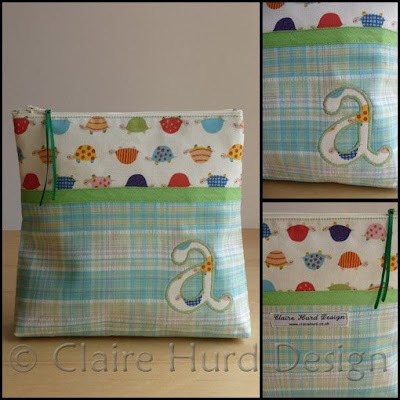 This wash bag was designed and handmade for Aimée. The tortoise fabric was bought mail order from Japan and is a really fun, bright print. 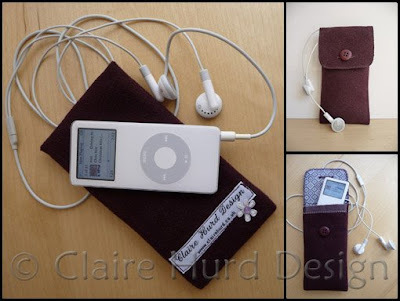 This Ipod case was designed and handmade for my friend Laura. I have a shop-bought one that is great for my Ipod but is a very tight fit when I add my earphones so I made this one with plenty of room for both. The silk lining was bought in a market in Shanghai. This bag was designed and handmade for a private commission. It was a Christmas present for a 5 year old girl with a love of fairies. 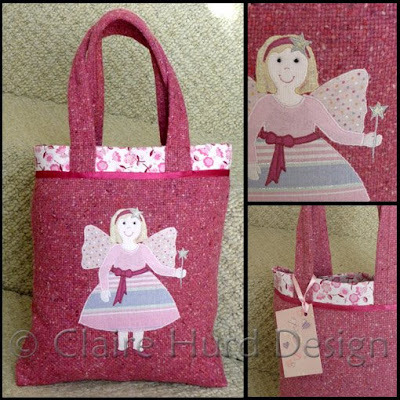 The wool base fabric makes it nice and strong whilst the deep pink colour makes it practical for a young child to use. Following my previous blog post regarding the production of a collection of greetings cards suitable for any occasion here is my range contemporary floral cards. These have all now been passed on to the customer and I am pleased to have positive feedback. I have also produced a small range of fish cards suitable for any occasion but mainly designed for the male recipient where a floral card is less likely to be appropriate. 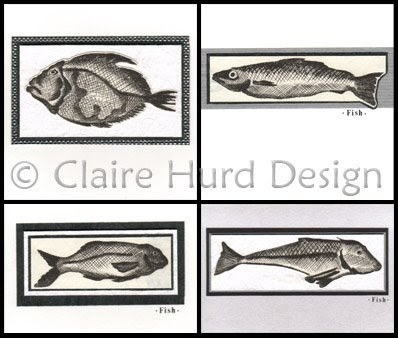 The images have been created by printing from a perspex plate on to which the fish have been etched by hand based on original drawings. 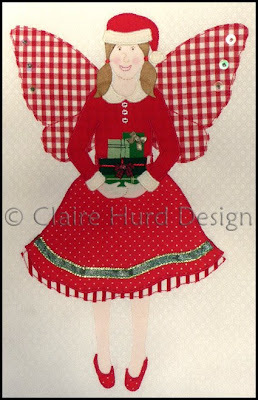 The image above shows the appliquéd and embroidered christmas fairy that I made for use on this year's Christmas cards. The fabrics have been secured using freehand machine-embroidery and satin stitch. The features have been hand-embroidered and button, sequin and ribbon bow detailing has been added by hand. I have not been able to take a photo showing the background fabric well (it is difficult with so little natural light at this time of year) but it is a white-on-white print with a little floral repeat pattern reminiscent of snowflakes. There is a nice contrast between this crisp white and the bright red resulting in a cheerful fairy motif that I feel would work well on many Christmas products from stationery to tableware and ceramics. 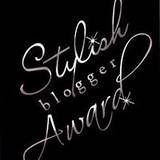 This is a much more simple design that I have also used this year. The Christmas tree has been created by first applying ribbons and ric-rac trim to a green wool base. 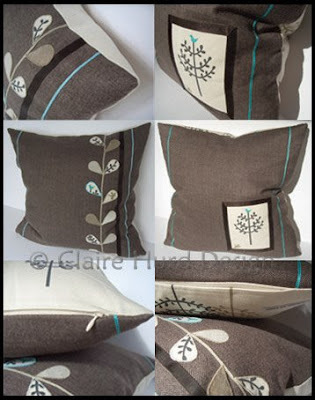 The tree motif was then cut to shape and top stitched around the edges to prevent fraying. 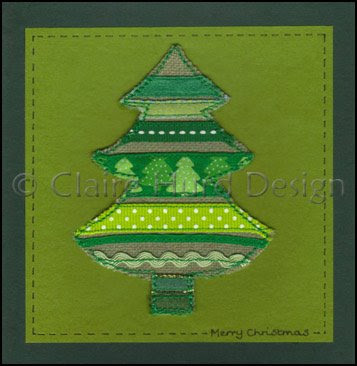 The fabric motif was then applied to the card base and hand-drawn running-stitch detail and 'Merry Christmas' text was added as a finishing touch. 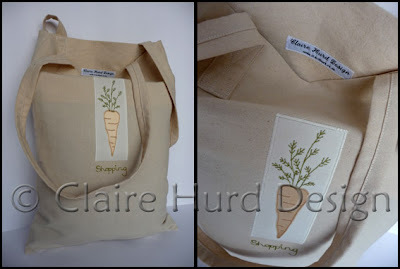 Today I am posting an update to the calico bags collection I mentioned last week. The bags shown above complete the collection and once again have appliquéd vegetable motifs and hand-guided machine-embroidered text. The only exception being the bag at the top left which has no embroidered text. The bags are all made using pre-washed calico and have double handles suitable for going over the shoulder. This is the first design from my calico shopping bag collection made using the appliqué vegetable motifs I showed you last month. The bags are made with pre-washed calico and have double shoulder straps making them comfortable to carry. 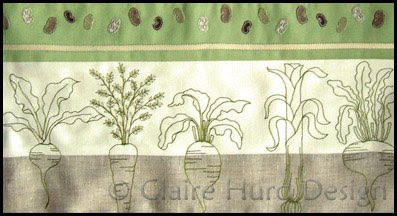 The appliqué vegetable motifs are complimented with a freehand machine-embroidered comment such as 'shopping', 'vegetables' and 'eat your greens'. As I have many gifts and commissions to make this month I thought I would sneak a little treat for myself in before it got too late. I had already made the grey snowman stocking for my partner so this weekend I made the pink snowflake one for myself. I am practicing on friends and family at the moment whilst I perfect the shape of my Christmas stocking pattern. Next year I shall be making these stockings to commission. 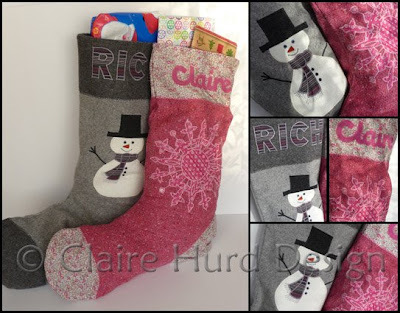 So...... if you like to be prepared (very) early for the festive season and would like a 2009 Christmas stocking handmade and personalised for yourself or as a gift for someone else, please contact me via email (studio@clairehurd.co.uk). I shall be posting more details and designs next year in plenty of time for Christmas so you will also be able to place an order then. Last week I received a private commission to produce a selection of greetings cards suitable for any occasion and my studio has subsequently been a hive of card making activity. The images shown here are a preview of the first cards in the collection. They have all been produced using printed images of details taken from embroidered and appliquéd artworks from my portfolio. The images have been layered up with handmade/coloured and textured base papers and have had button and jewel detail added where appropriate. The next group of designs for this card collection will be contemporary florals. I shall post some images of this group once they are ready. Having been a fan of refusing plastic bags and using my own cotton alternative for a long time I am really pleased that this practice is now becoming the norm. There are many calico shopping bags currently available from supermarkets, city councils and as fashion items from high street stores. 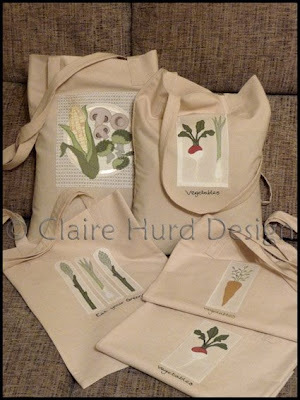 The appliqué vegetable motifs above are to be used on my own limited edition collection of calico shopping bags. I think I shall add some embroidered text and perhaps a splash of colour with bound seams. I shall post the finished items for you soon. I am currently taking a little holiday so no design post today - sorry. I shall be back with more designs for you next week. 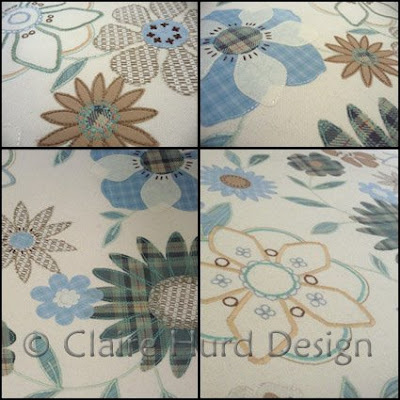 In keeping with the current trend for tartan I have created my new floral artwork using a muted grey/duck-egg tartan fabric and co-ordinating geometric prints on a cream ground. The overall effect is contemporary yet soft, making the design suitable for interior textiles such as bed linen. The stitch detail is a mixture of freehand machine embroidery and hand-embroidery. The result is fresh and crisp whilst still maintaining a soft and organic feel with the muted colour palette and floral motifs. This is the second installment in my series of posts showing my framed artworks for children. 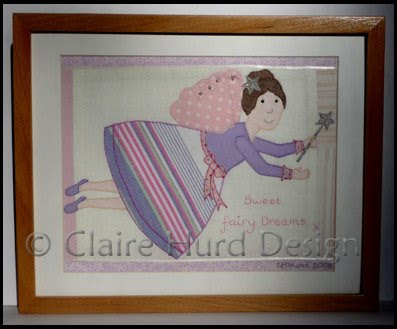 This design uses nice soft pastel colours and has the hand embroidered text 'Sweet Fairy Dreams'. 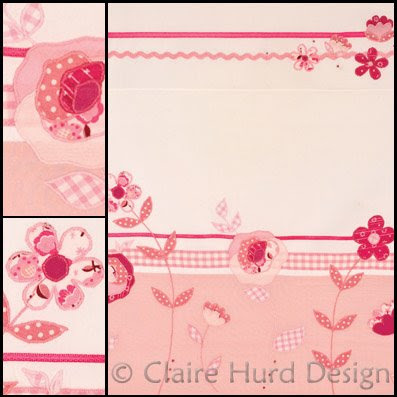 There is a narrow patchwork border and fine ribbon detail top and bottom for added surface interest. Metallic fabric has been used for the wand and star and bead and sequin detail has been added to the wings. I think this picture would make a lovely addition to any little girl's room. 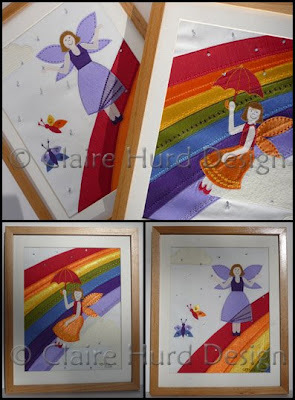 Today I am posting images of a pair of framed artworks I have created for a girl's room using Rainbow Fairies motifs. The appliqué fabrics are all polyester satin giving a really nice bright sheen to this design. The rainbow has been embellished with decorative machine embroidery in co-ordinating colours to create subtle surface texture. The raindrops are tiny beads and have the added sparkle of a tiny sequin behind. This week I have been working on some new bag designs. 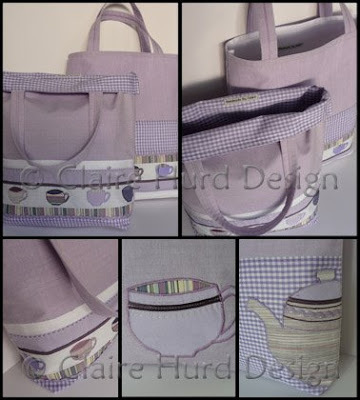 The pair of lilac bags have been created around the Tea Time theme and were made very much with my super tea drinking friends in mind - you know who you are! 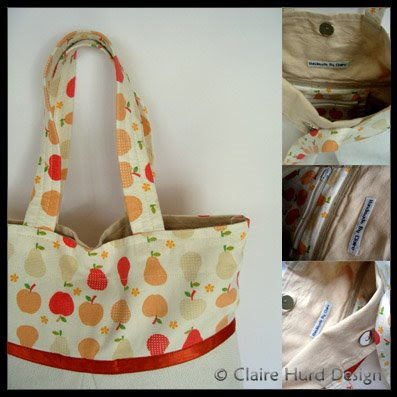 The Apple and Daisy bag has a real summertime picnic feel to it and is a nice fresh contrast to the grey weather outside today. 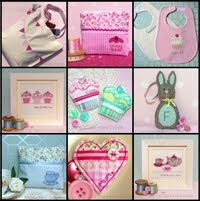 All the bags I make are individual and crafted with care using fabrics that are precious to me for various reasons. They are all fully lined and have nice sturdy handles. The bags shown here would make great reusable shoppers and the lilac Tea Time bags are large enough to be work or book bags. I am taking a little break from repeat pattern designs this week and working on some more floral appliqué designs. The details above have been taken from a larger artwork combining scattered floral appliqué motifs with ribbon and ric-rac stripes. The overall effect is contemporary and crisp with a handmade touch. 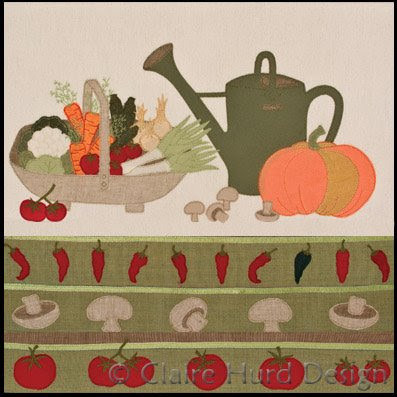 This design would work well as either bedlinen or kitchen textiles such as table runners and napkins. 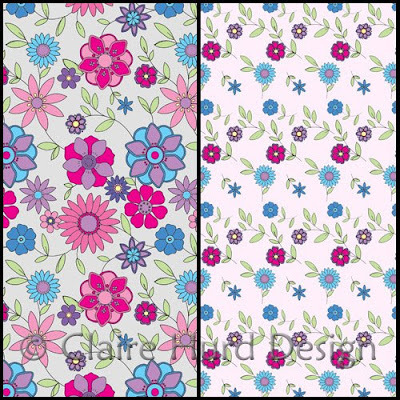 Following on from my previous two posts here is another floral repeat pattern designed for use on stationery or giftwrap. Regular readers of my blog will recognise the motifs from my original blog header. The repeat design has been created from a collage artwork that I produced a while back, I really like the colours and textures of the papers used. 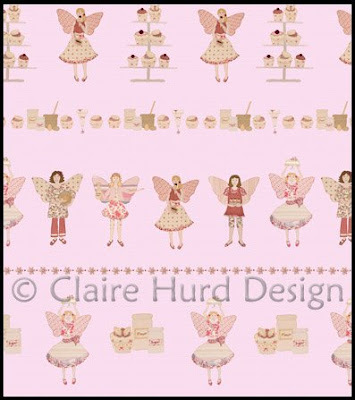 Again, I think these designs would work well as a double sided wrapping paper but could also be used for a giftwrap set with co-ordinating greetings card and gift tag. 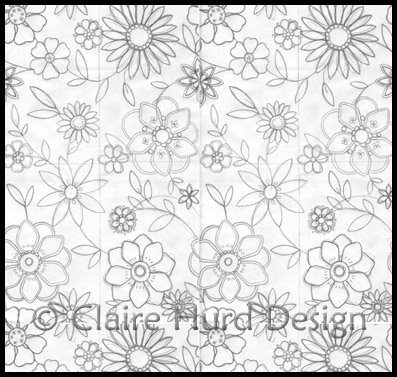 Today I am posting the floral repeat pattern I created last week as a new colour version. I have refined the repeat pattern and am pleased with the results, I think the motifs flow nicely. I have also created a co-ordinating repeat design that is much more simple. I really like the idea of these patterns being used as a double sided wrapping paper. I shall work some more on the co-ordinating design to get the spacing a bit more even and will then experiment with further colouways. I am currently working on a floral collection and am experimenting with putting my designs in repeat. 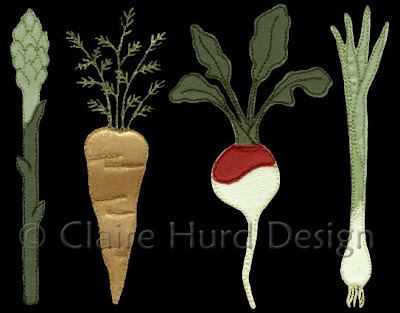 Much of my previous work, as with most embroidery designs, has been single motifs or illustrative scenes. I am therefore taking the opportunity to do some repeat work whilst familiarising myself with features of Adobe Photoshop and Illustrator that I have not made great use of so far. Above is a sneak preview of one of my repeat designs. I shall refine it in Illustrator and then experiment with colourways. I am aiming to compile a collection of floral print designs with embroidered co-ordinates. Today I have been experimenting with repeat patterns. 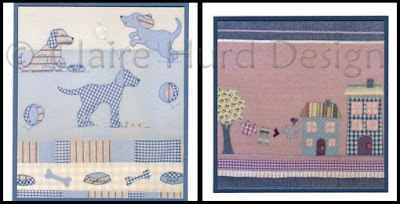 I have been using motifs from two of my favourite designs - 'Fairy Cakes' and 'Patchwork Dogs'. I have manipulated the images and played about with placement creating repeats using Adobe Photoshop. As previously mentioned on my blog, I really love the idea of my designs being used on stationery and giftwrap. These two repeat designs are my first step towards achieving this. I am pleased with the results yet eager to experiment more to perfect the designs and get to grips with quickly creating seamless repeat patterns on Photoshop using my embroidered motifs. My new business cards have arrived! My brother Michael was kind enough to take a whole new set of photographs of my work for me last weekend so I can use the images for promotional purposes. I have had new business cards and postcards printed by Moo Limited (http://www.moo.com) and am really pleased with the result. Their website is really easy to use and enables you to use a different image for each card, my order was also processed and delivered within 3 days - very efficient! 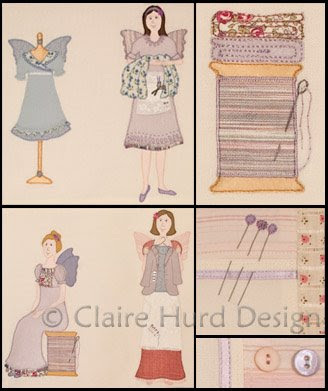 I thought I would post a little patchwork of details from my Fairytale Princess designs today. I quite enjoy creating fairytale designs with castles etc but have to keep reminding myself to keep it simple - it is very easy to get carried away with turrets and flags! I hope to be able to do a really detailed fairytale princess design at some point that will be a framed artwork. I would like to spend lots of time on it and focus on detail such as fancy windows and rambling roses climbing the castle tower. I will probably use the traditional poses of the princess in the tower and the prince on a horse but will try to make the overall effect quite different from what I have done before. 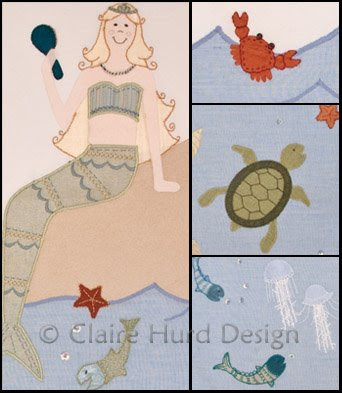 These images show details taken from my mermaid appliqué artwork. The colours are fresh, the characters quirky and overall I like the effect. I carefully selected the fabrics for use on this design and have made use of some really nice textures including metallic sheers for the mermaid tail and rip-stop fabric for the jelly fish. The bubbles have been created using transluscent sequins with a tiny bead at the centre. 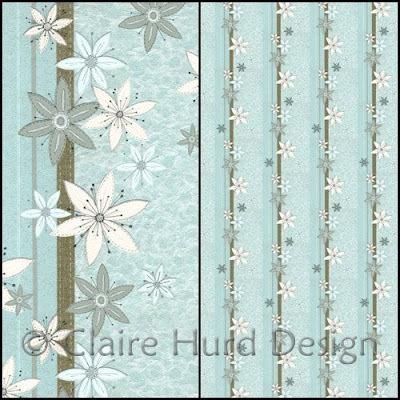 This design would work well for either an interiors collection or stationery. 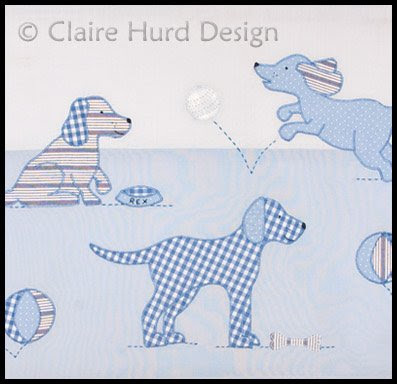 Today I am posting a couple of sunshiney embroidered and appliquéd children's illustrations. 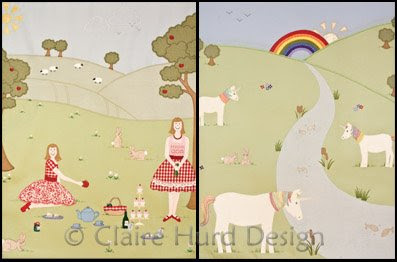 Firstly a summertime picnic and secondly a unicorns design. I like the fresh colours I have been able to source for these designs and the rainbow as a focal point. I think I shall use rainbows more in my children's designs as they are great for a splash of colour. I have two new bags to share with you today. The cream bag at the top is a trial of a new pattern I have developed this summer. I am happy with the size and shape. It works well as a book bag or extra shopping bag. Once again I have made use of a really lovely Shinzi Katoh print and have plenty more where that comes from so keep your eyes peeled for more bags in the future. The bottom bag is a re-vamped linen bag that I was sent as a free gift. The bag was huge and I could not think of a use for it so I cut it down in size and added this lovely Liberty print lining. I have folded the lining fabric over the top of the bag to create a border and then disguised the seam with a satin ribbon. I added a button to fasten the bag and hey presto - a spare bag to keep with me ready for emergency shopping trips! Having recently sold another children's animal design I thought I would post some of my avaiable cats and dogs designs. 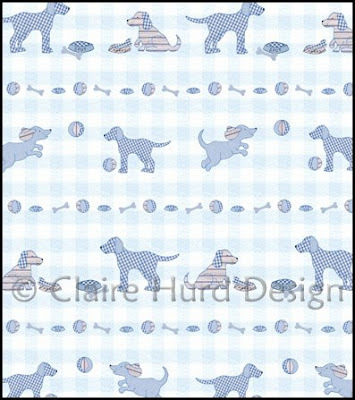 For the patchwork dogs design above I have kept the number of fabrics used down to make it an easy design to reproduce in bulk production. 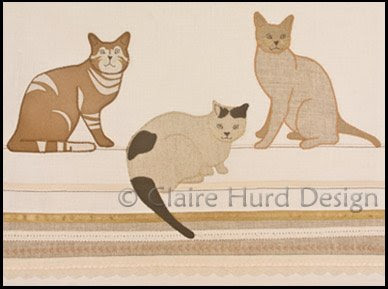 For this design a really soft brushed cotton has been used for the kittens. 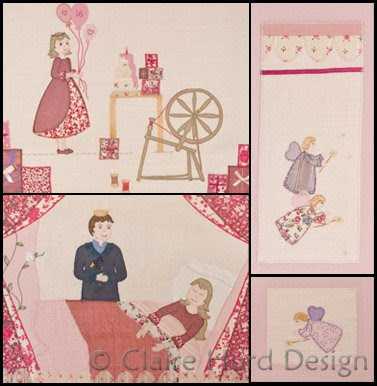 The patchwork fabrics are all is pastel colours making this design suitable for younger children - possibly a nursery design. 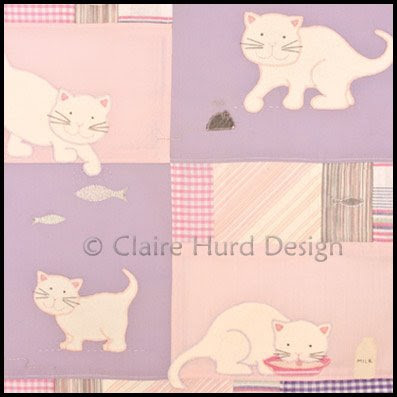 I have produced this cats design in a more classic style and colour palette to target an older children's/ adult market. The shapes have been kept very simple but hopefully capture the character of each cat. All images shown are small details of larger appliqué artworks. Today I am taking a break from my embroidered artworks and have decided to post images of recent items I have been making for our home. I am really pleased with the cushions above, not only because they look good in our sitting room, but also because they gave me an excuse to use some of the lovely wool fabric I bought in Shanghai and a great Shinzi Katoh print I bought from nuno (http://www.nuno-plus.com/). I have only recently discovered the Shinzi Katoh's fabrics and am completely hooked! These little storage boxes have been made from bags I no longer used but had been refusing to dispose of (yes, a girl CAN have too many bags!). The blue one is a Cath Kidston book bag that I had used so much I had worn out the handles. The purple one is a TopShop bag I was given a couple of years ago when I bought a dress there - much nicer than your usual plastic bag. I simply altered the shapes to the size I wanted, lined them with contrasting fabric, turned the top over and trimmed the edge. I am pleased with the result, they are great for storing all my notebooks. I seem to be slightly addicted to nice notebooks and have loads - I do use them all though, promise! I have been doing a lot of work on designs for girls recently so thought it about time I did some more gender neutral designs/designs aimed at boys. 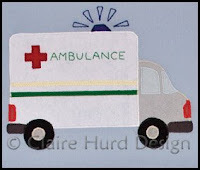 My first in this new collection is an emergency services design. 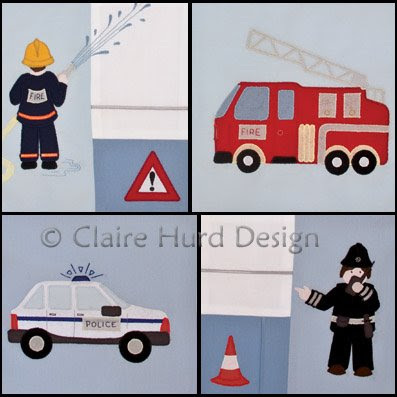 The images shown here are details from a larger appliqué artwork. I have tried to keep all the shapes quite simple and avoided detailed features on the characters to make this design an easy one to reproduce in bulk production. 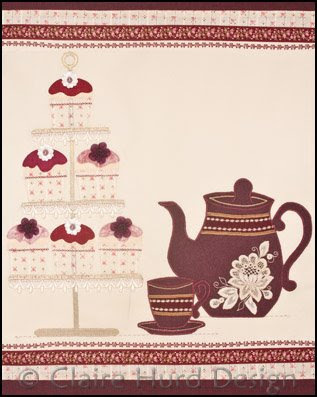 This afternoon tea and fancy cakes inspired appliqué design is aimed at both the kitchen textiles and the greetings card and stationery markets. The cupcakes have been given added detail with applied flower motifs, beads and buttons to make them more fancy and good enough to eat! 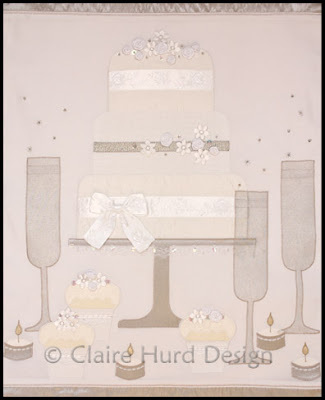 This appliqué artwork has been specifically designed for the wedding stationery market. I have used a very traditional and limited colour palette and made use of luxury fabric textures such as velvet, silk and metallic sheers. The cake decorations and champagne bubbles are created using ribbon flowers, flower motifs, sequins and beads giving the design more depth. The different fabric textures and added detail on this design will make it look luxurious and maintain the depth of the design when reproduced graphically. More garden designs today, this time with more emphasis on vegetables and using a brighter colour palette. The details above have been taken from a larger appliqué artwork created using appliqué, freehand machine embroidery and ribbon detail. I particularly like this second design, it has more refined detail and I am pleased with the colour balance. 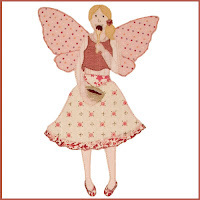 The images are quirky and yet precise and the quality of the embroidery has come out well. 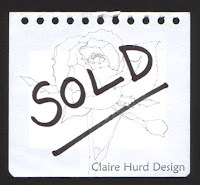 I have removed the image of this design from my blog as it has now sold. It was sold to an Italian company so chances are I shall not see this one in production in the UK - a real shame as it is one of my favourite designs. I shall keep my eyes peeled for it anyway and shall post images of the final product should I find some. 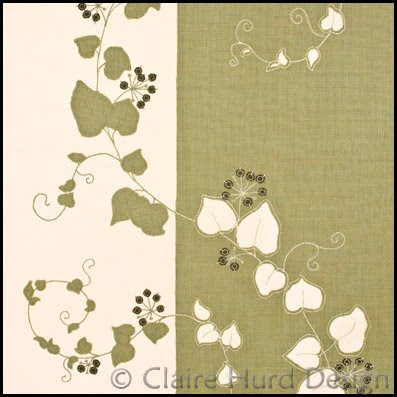 Today's post shows examples of some of my garden inspired designs. 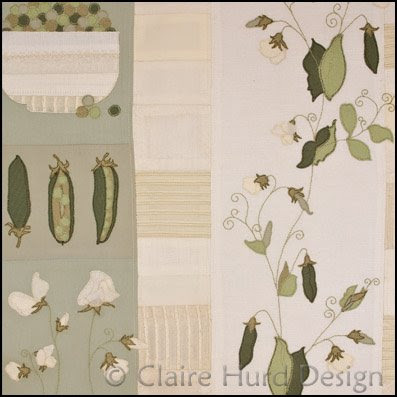 The Pea design above is appliqué with hand-guided machine embroidery and delicate fabric textures. I really like the soft tones of this design and the delicate pea-flower shapes. This leafy trail design uses the idea of positive and negative. It is effectively two layers of fabric; the leaves have been cut out of the green fabric exposing the cream below and then applied to the cream fabric base opposite. I like the contrast effect of this design and the lovely green wool fabric from China, it is a really fesh colour without being too bright. 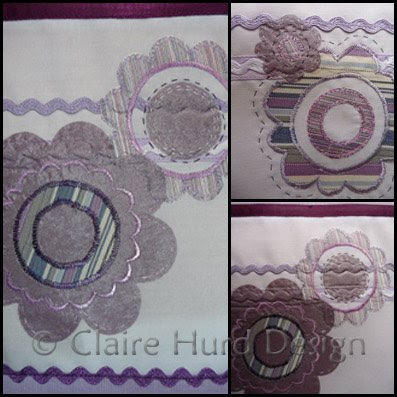 I have posted a detail of this design to demonstrate the effect of freehand embroidery on the sewing machine. This is a technique I intend to use more in the future as I really like the fine lines and the hand-drawn/sketchy effect achieved. This design is a return to the more bold and simple shapes suitable for easy reproduction and bulk production of interior textiles for children. 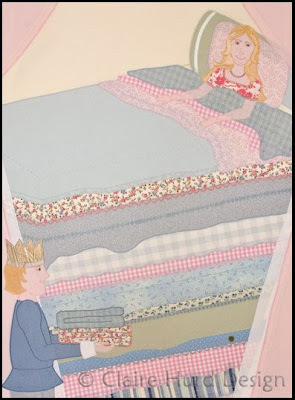 The different appliqué fabrics used on the bed could also be used as borders or on co-ordinating items. The pea should be a contrasting fabric quality/texture or solid embroidery in order to make it stand out. This design would also work quite well reproduced in print with some embroidered detail on top for added interest. 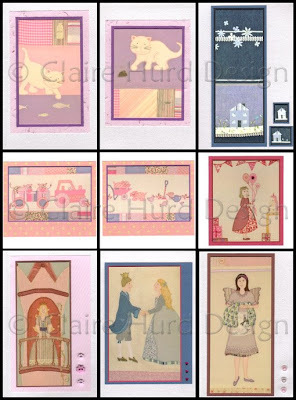 Today's images are examples of some of my more intricate embroidered appliqué characters. 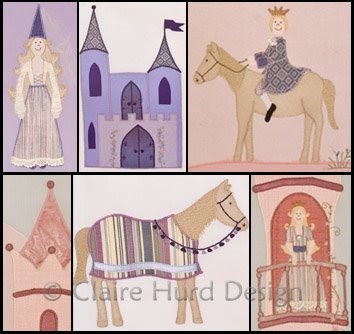 These designs are suitable for embroidered book illustrations or stationery. I enjoy the opportunity every now and then to do some really intricate work and would love to see these digitally reproduced. Perhaps I shall work on these designs further in Photoshop and get some greetings cards printed. The top design shows seamstress fairies working on new fairy fashions. This design brings to mind the children's story 'The Elves and the Shoemaker'. The bottom design is based on the classic children's story 'Sleeping Beauty'. Today it is back to children's designs, although I feel that these two designs would also be suitable for older girls/adults products. These designs have actually turned out to be two of my favourites and I would love to see them not only on textiles but also on stationery products. I think they would make really pretty cards and gift wrap. 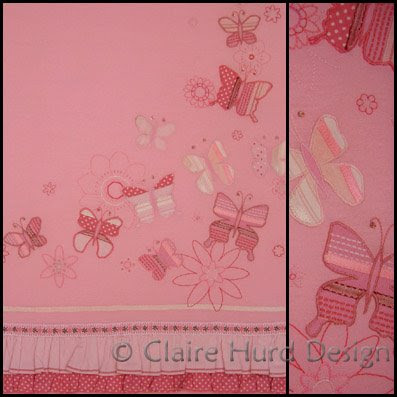 The butterflies on this design are made up from strips of fabric and ribbon/trim and then appliquéd to the jersey base. All of the flower outlines have been embroidered by hand. The frill finishing off the bottom of this design makes it suitable for use on children's fashion, I imagine it as a layered skirt and t-shirt set.